This spicy orange chicken is one of those “there aren’t going to be very many leftovers” dishes. We knew it as soon as we started eating. The sauce on the chicken is just crazy good. A slight hint of orange. A slight spicy kick. The chicken is fried quickly and perfectly, with just a slight crunch. We loved this dish and then some. I’m a big fan of green onions on dishes that are Asian-inspired such as this spicy orange chicken. I need something to cut thru the sweetness, the soy sauce. So I tend to be a bit heavy-handed when it comes times to sprinkle on the sliced green onion. Don’t be afraid to add more crushed red pepper to the sauce. Also try my copycat of Panda Express’ SweetFire chicken. Combine chicken, egg whites and soy sauce in a bowl and let stand 15 minutes. Meanwhile, heat oil in a large Dutch oven or deep fryer to 360 F.
Working in batches, remove chicken from marinade. Shake off excess then roll in the cornstarch. Fry until golden brown and cooked through, about 5 minutes. Remove to a paper towel-lined plate. Make the sauce by heating 1 tablespoon of oil (you can also use 1 tablespoon of the oil from the fryer) in a large skillet. Add the garlic and red pepper and stir-fry for 15 seconds. Dissolve the cornstarch in the water and stir into the skillet. Add the Orange Sauce and soy sauce. Reduce heat to a simmer and continue simmer, stirring, until thickened. Add in the chicken and stir to coat. Serve over rice topped with green onions. 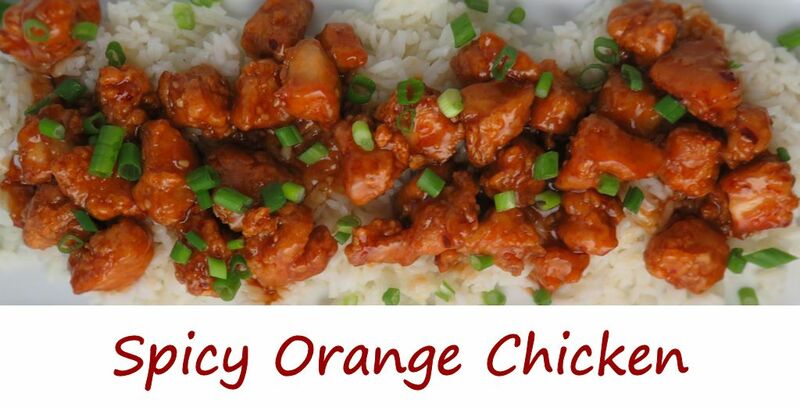 This entry was posted in Main Dishes and tagged orange chicken, recipe, Spicy Orange Chicken by Mike. Bookmark the permalink.